We made our next landfall neither in Cook's Harbour nor in Newfoundland for that matter. As we approached the entrance of Cook's Harbour, C-map showed us heading straight in the direction of a nearby island which meant an error of more than half a nautical mile. This time correcting the datum error made no difference, there was something seriously amiss. Ahead of us was a narrow passage unknown to us, heavily breaking waters, and we had no electronic chart to guide us through. The buoys marking the passage into the harbour were covered with welter of foam and the wind was picking up. It was clearly too risky to try to find our way into the harbour. This time, Pekka had enough common sense to agree with me, and we continued our passage to the next conceivable port which was, unfortunately, on Labrador's side of the Strait of the Belle Island. It was called Red Bay, and it was a place to remember! What should you do when a beluga wants to be friends with you? This was the problem we were faced with while anchored in Red Bay, Labrador. 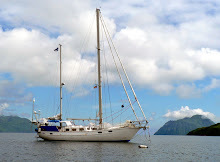 We arrived in the little bay late Saturday evening in total darkness and did not discover until the following morning that we shared it with a lone beluga. 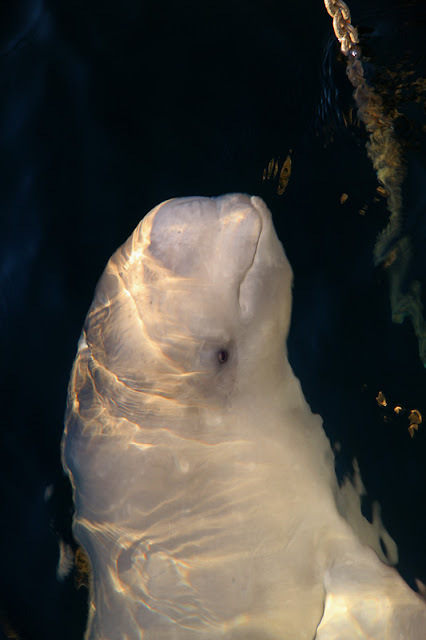 We felt a little apprehensive it being alone as we knew that belugas are sociable creatures who are usually in parties of five to ten individuals. 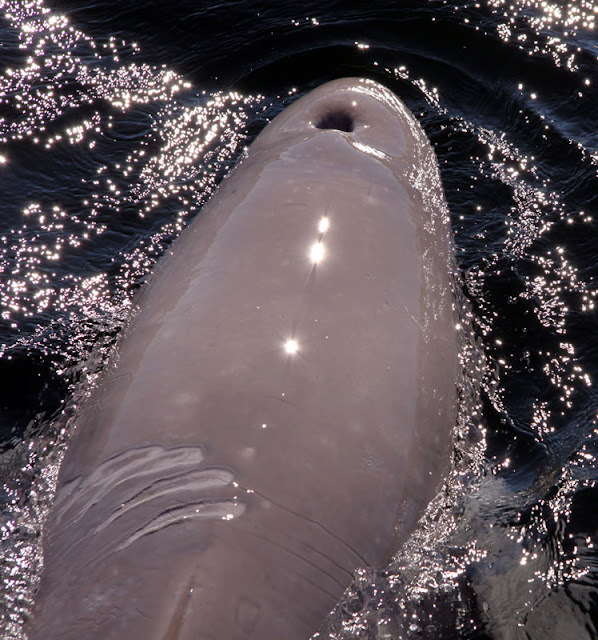 The beluga had, on his back, well healed but distinctive marks made by a propeller which could be the reason why the pod had been forced to leave him behind. As far as we could judge, he was a young beluga but not a calf, and we thought he seemed healthy and active enough although we are no beluga experts. He kept diving close to Sarema for the better part of the morning feeding on something he found at the sea bottom. After a while, he seemed to acknowledge our presence and circled the boat every once and a while. But it was not until Pekka lowered our light grey dinghy from the davits that the beluga knew that he had found a true friend. After that, the beluga and we were inseparable. 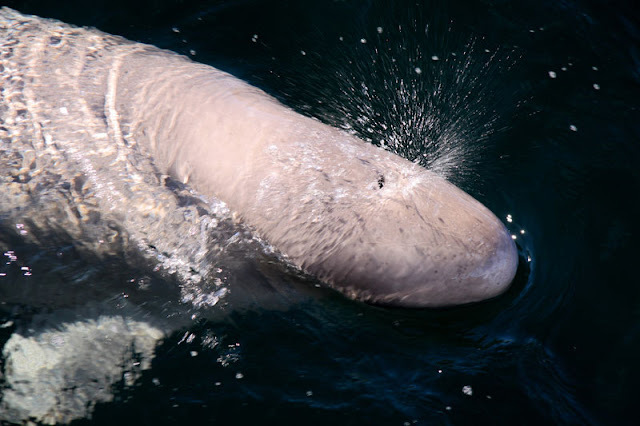 When we went ashore, the beluga came along swimming directly underneath the outboard propeller so that we eventually had to turn it off as we were afraid that he would hurt himself. Now, the only way to proceed was rowing but that too was difficult as the friendly beluga was constantly in the way of the oars. Finally, we had to resort to cunning. 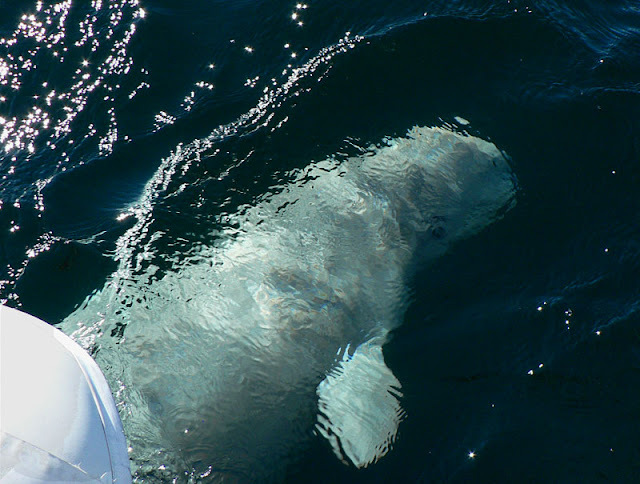 As the beluga was swimming around the dinghy, we kept our eye on him and when he was at a distance of about ten metres from us, Pekka quickly turned on the outboard motor, and off we went. We could see the beluga raise his head in astonishment and dash after us but we were too fast for him. He didn't reach us until we had to slow down near the shore due to possible rocks, and again we had to start rowing as he came so close to the outboard motor. When the water became too shallow for the beluga, he finally turned around and swam away. When heading back to the boat, we carefully monitored the bay in order to spot the beluga, and when we saw where he was, we started off in the opposite direction in order to avoid him, and made a large circle to reach the boat. But, in about fifteen seconds, the beluga appeared by the side of the dinghy, and seemed to be more than happy to be reunited with us. When it was time to continue our journey, the beluga came to help us weigh the anchor, after which he escorted us to the mouth of the bay. We were a little anxious about the possibility that he would follow us out to the sea but, after a while, we couldn't see him anymore. This was a relief although, at the same time, we felt bad about leaving this friendly and curious whale behind. He is undoubtedly a very exceptional beluga, and we feel honoured to have made his acquaintance.